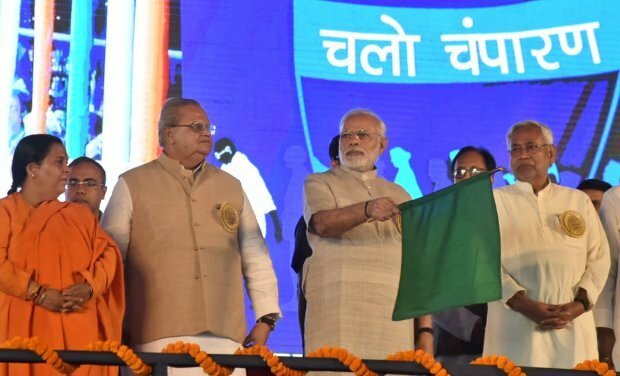 Prime Minister Narendra Modi on Tuesday lavished praise on Bihar Chief Minister Nitish Kumar and also pledged to fulfill the sanitation dream of Mahatma Gandhi. “Bapu ke sapne ko pura karke rahenge,” Modi told a rally of some 20,000 ‘Swachhagrahis’ (cleanliness ambassadors) to mark the Champaran Satyagraha’s centenary celebrations here. Modi said the sanitation and cleanliness drive of his government was a people’s movement and it was the largest such campaign in any country. The theme of the centenary celebrations is “Satyagrah se Swachhagrah”.